How could you look at Egypt without touching on the captivating subject of hieroglyphics! We (unintentionally) took a backwards approach to learning about early language: First we used the iPhone to find this great website that simplifies the complex system of writing to an easily palatable kid friendly format. We then noted on paper the children’s names (using the website as our guide.) 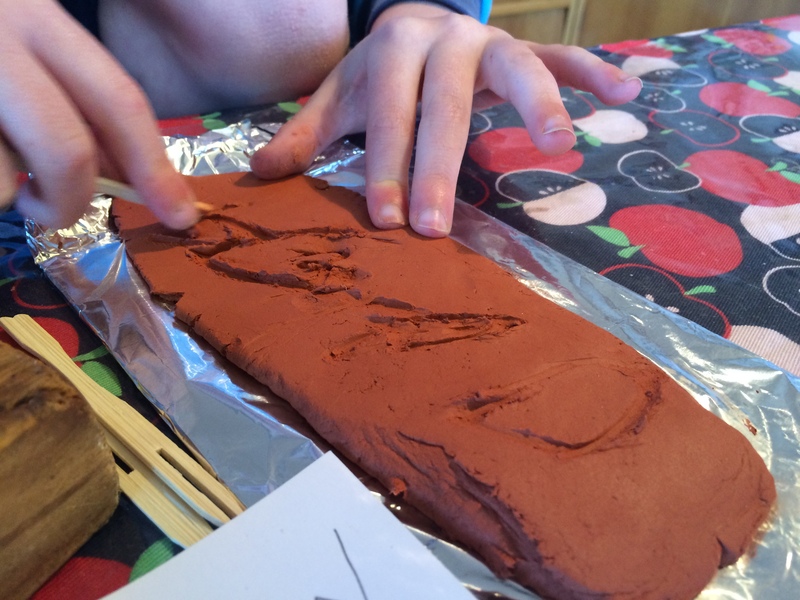 Then we took our paper and transformed it into a more fun (and historically accurate) medium; the clay tablet. From a very general sense it is widely believed that improved farming techniques (and thus an increase in yield) allowed early communities to trade goods with one another, and as trade increased there was a need for improved notation of the transactions (so, in a sense, very early writing was basically accounting!) As trade increased so too did the written ‘vocabulary’ until eventually ‘writing’ was used for important things (outside of accounting!) like scriptures and such. The lack of paper and pen in the final stage of this activity (when the kids transferred their name to clay tablets) was particularly good at drawing attention to how the written language evolved from pictorial representations (that are quite difficult to make as marks in clay with limited tools) to a simplified form that eventually evolved into an alphabetic system that we use today. Now, I’d love to tell you that we are looking at the industrial revolution (and thus how the printing press brought written language to the masses) shortly, but to be honest my planning hasn’t got quite that far ahead yet! Come on, you know you want to get those little fingers into some clay!